You Drink. You Drive. You Lose. 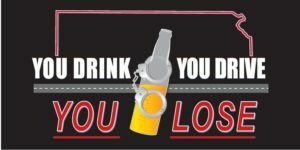 August 16 through September 3, The Brown County Sheriff’s Office will join 150 other local and state police agencies across Kansas in an effort aimed at removing drunk and other drugged drivers from the roadways. During 2017, in Kansas, alcohol and other drugs were implicated in 40% of the crash deaths on Kansas roads. Over the course of the year, this equated to one person suffering death every two days, and at least 163 families receiving death notification visits, all due to drivers’ decisions to drive impaired. According to KDOT, over the past 5 years the average proportion of fatality crashes attributable to alcohol impairment, alone, is 23% – or almost 1/4 of all fatality crashes. The agency also reports that crashes involving at least one impaired driver are likely to be more severe than are other crashes. For example, the risk of serious injury in a chemical impairment crash is almost 5 times that of the crash where such impairment is determined to have not been a factor. More striking is the fact that the risk of death is over 15 times higher in the case of an impairment crash. Clearly, impaired drivers need to be taken off the road, for their good and for the good of others sharing the road with them.